While I bravely struggle on with the next chapter of “Willow the Vampire and the Würzburg Ghosts”, I’m still researching motives ghosts might have for haunting the living. Denmark seemed an unusual choice for the un-dead, but when I started reading up on one of Northern Europe’s most haunted places, I realised it wasn’t just Hamlet who had the hump with his castle existence. Dragsholm Castle, which was converted into a hotel in the late 1930s, proudly boasts no fewer than three regular ghosts. Two lady-ghosts who appear to remind us, I think, how terrible life was for women in days gone by and one male ghost, who was imprisoned in the dungeons at Dragsholm and has ever since had a question mark hanging over his high-born head: how did he actually come to meet his end? Did he commit suicide during his imprisonment because he’d lost his marbles after five years of solitary confinement or was he murdered? The hapless man was none other than the 4th Earl of Bothwell, married to scheming Mary Queen of Scots, who herself was a thorn in the flesh of Queen Elizabeth I. With such a family connection…who needs enemies? Every birthday card might contain explosives, every pair of Christmas socks might be spiked with poison and every visiting day might bring an assassin to the dungeon’s gates! 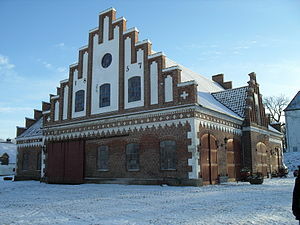 If you’d like to find out more about Dragsholm Castle’s history and its former occupants, head over to http://mariathermann.com, my regular writer’s blog. Leaving royal madness out of the equation for the moment, I feel the other two ghosts have legitimate reasons to haunt the living and may serve me well as inspiration for my own ghost story. The “Grey Lady” ghost at Dragsholm is allegedly the ghost of a maid who once worked in the 800-year-old castle. Treated well when suffering from horrendous toothache and surviving her ordeal, she clearly has every reason for returning to repay her dentist in kind. In previous centuries any ailment, no matter how small, was potentially lethal. A tooth infection, which was likely to have been the cause of the maid’s pain, could have killed her within a matter of days. The lovely girl’s still returning today to thank people for their kindness it seems…on the other hand she may still be owed wages, which she’s trying to collect. The “White Lady” ghost at Dragsholm Castle is a romantic apparition that doesn’t seem to be out for revenge but wants to highlight her plight, while she is still looking for her long dead paramour. Playful and charming in life, she simply wanders the corridors now that she’s dead. As a girl of noble birth and the daughter of a former castle owner, she fell for the charms of one of the serfs working there. When her father found out about the long-standing affair, which the two lovers had kept secret, he was so angry he ordered his servants to brick up the poor girl in one of the castle’s most substantial walls. 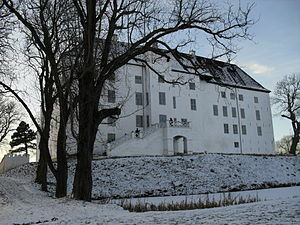 According to the legend, every night the White Lady returns to Dragsholm Castle in search of her lost lover. The spooky twist in the last story is that during restoration works in 1930 several old walls needed to be opened up to allow for modern sanitation and plumbing to be installed. During the process workers found a small hole in one of the thickest walls; peeping through, they discovered a petite skeleton wearing a white dress cowering in a recess. A true story apparently and well documented by witness statements taken at the time. Here’s a ghost with good reason to haunt the living daylights out of any tyrannical father who happens to cross the threshold of Dragsholm Castle Hotel in search of bed and breakfast and a family he can oppress! Yet, she chooses to be mindful of everybody’s bed rest and just glides along the deserted hallways like a wistful cloud. The legends of the two ladies lead me to believe ghosts retain most of the characteristics they had when still mingling with the living, an interesting fact I’d like to use in my novel. While the two lady-ghosts do their haunting on foot and rather humbly, the male ghost is quite a show-off and still insists on his noble birth right today. Arriving with a horse-drawn carriage in the castle courtyard, where apparently prisoners received their judgement in the 16th century, the 4th Earl of Bothwell’s aristocratic horses clip-clop about with so much noise on cobbled paving, the castle’s guests are forced to reach for their ear-muffs night after night. Bothwell could have just turned up in his frilly nightie and haunted the dungeon’s tour guide after the 4.00 o’clock tourists have left or taken it out on the night porter in the foyer or meddled with the guests’ food in the banqueting hall. Instead, he chooses night after night to dress up in full 16th century garb and arrive in “state” with a carriage and horses. What does the Earl want? To tell us he was murdered or to complain about his unjust imprisonment? Or is he merely trying to book into the most appropriate inn in the Zealand neighbourhood? Maybe his madness is the reason for his return – a caged mind rattling round and round in a tiny prison cell for five long years? Perhaps the echo of that unspeakable torture still reverberates through the castle today? Once a sighting has taken place, the living start spinning the tale and it is hard to know what the real reason might be for the dead to return. Ghost story writers like Sheridan Le Fanu or Wilkie Collins might not be inspired by the Grey Lady, but I’m rather touched by her story; perhaps there are other kindly ghosts out there, like the Petermännchen in Schwerin I wrote about last week. Unfinished business and revenge may be the reasons behind the Earl’s and the White Lady’s nightly appearances, but there’s no unfinished business or vengefulness behind the Grey Lady’s apparition. She merely wants to reassure herself that all’s well with the citadel’s inhabitants. Just like Schwerin’s Little Man Peter she’s retained her kind nature in death – an important point that I shall use in “Willow the Vampire and the Würzburg Ghosts”. Perhaps it is the fear of death and the process of dying that prompts the living to ascribe sinister motives to every ghost? I for one feel rather comforted that there may be ghosts who, unlike Hamlet, haven’t got perpetual murder on their mind but would like to look after those they were fond of in life and still associate with a specific place. At this point some of you will cry there’s no such thing as ghosts! Show us some proof! Indeed Hamlet, as writer Michelle Barber from Loony Literature’s Lab will tell you, was not even a ghost but a Shakespearean Prince of Denmark whom countless generations of actors have killed for to portray on stage. To my mind that makes him a ghost, as his attention-seeking, petulant spirit still haunts us today. Didn’t he tempt David Tennant to leave Dr Who…surely sufficient proof of a malevolent spirit being at work? Today I read on Twitter that Merlin’s alter ego young Colin Morgan wants to go back on stage…undoubtedly he’s the next Hamlet-victim in the making. What more proof could there possibly be – ghosts do exist! Well, Danish ones at any rate. Brilliant post – I adore your wonderful cartoons as well, they are excellent. We have David Tennant’s Hamlet on dvd and love it. Will is desperate to play him when he is older. I love these posts – what with these and Most Haunted, I’m having a rare old time. Thank you! I was trying to find an SEO link between ghosts, haunted homes and fantasy on TV but the only thing I could think of was David Tennant and Hamlet. Worked quite well in the end, not too cheesy. Watched Mr Tennant (who plays his own twin brother) in Nativity 2 film yesterday – not a great film, but it does have its moments and sees him reunited of sorts with actress Jessica Hynes, who was Mr John Smith’s/ Dr Who’s bride in a First World War two-parter that I loved. Hard to believe that the same man could be in Nativity 2! Will mentioned that film but we haven’t seen it yet. I guess you need a tummy full of Christmas cheer and mince pies to appreciate that one – thought most of it was unfunny rubbish and quite irresponsible, given that children like to immitate. Really – you know that totally bums me off. Kids and teachers stealing a donkey from a field and then lowering the donkey down a hill with a rope…kids snatching their baby brothers and sisters out of their cots and bringing them into school…not very responsible writing, is it. It sounds really irresponsible to me, I don’t know how they get away with a lot of the stuff they are churning out. I watched the film in the afternoon – with one mum and her little son…the cinema was empty otherwise…probably tells you all about the popularity of the film despite David Tennant’s starring role. Yes, it is amazing that the cinema was so empty when Tennant was in a film. It does sound a bit naff though. PS: is Will going to play Hamlet with his best Allan Bennett accent? I’d steal to get a ticket for that! I don’t think so but I will put it to him!!!!! It will be a Young Vic sensation! You bet! At the moment we are in the middle of doing Horace Gawp’s Christmas Carol so Alan Bennett is in his full glory in bed with a Christmas hat and a teddy bear. The next post to go up is “Carol Singers For Beginners” – no complaints, please!!!! Tip: put your special festive ear muffs on. Oh, I’m already gargling with lemon and honey so i can sing along (I used to sing in a choir as a kid and young woman – did you, too?). Am so looking forward to this latest Horace caper now! Yay. My love – when you hear me singing, you will take that question back. Oh, is this another thing we don’t have in common then? Like Merlin-mania, real Christmas-tree hugging and you not having seen Buffy, yet? WOW. Well, I agree with the Merlin and Buffy. I don’t totally agree about the tree thing because I love real Christmas trees – so that’s debatable. As for the singing, I love singing and was in a choir as a child but my voice needs training so I would say that you are probably very good at singing and I love it but I’m not. So I don’t think we can truly count the singing and the tree, it’s just that I’ve fallen off the path and need to be brought back on it.